You can get your first stunning view of Durham castle and cathedral from the train as it draws into Durham station. Built together high above the town, they almost seem to float in the clouds on a day when a bank of mist has settled over the houses and the lower dwellings, but up here on the train, on its lofty brick-built viaduct, you are at the same elevation, looking the castle in the eye with the cathedral behind it, marvelling at the labour of past generations, their stone constructions, all square corners, towers and turrets, and extraordinary size. The castle is a college of the university, a hall of residence, quite prosaic really. There is a college porter who keeps the gate, looking askance or maybe with tolerance, as the students bring in their girlfriends. He carries the authority of the ancient gatehouse where he sits behind a grill, keeping careful note. Who could not sit there without carrying the weight of a whole line of gatekeepers, men who watched, lowered drawbridges or raised them, gave signals, heard armies depart, clattering on the cobbles with pennants fluttering? 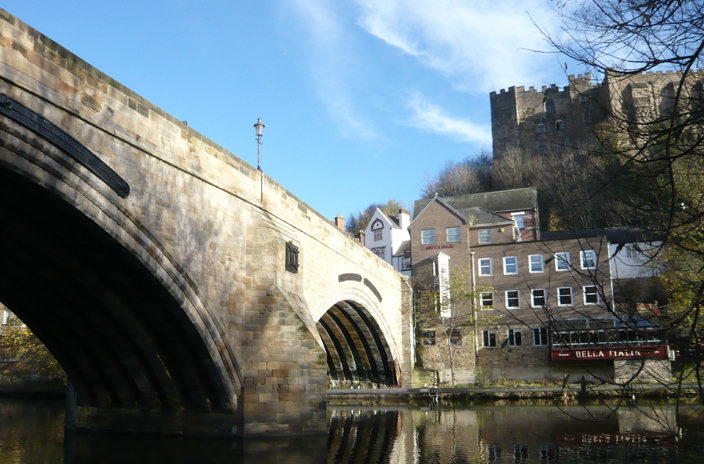 There is no drawbridge now at Durham castle, and there never was a moat. But the castle does not need a moat for it is bounded on three sides by the River Wear that coils like a snake round the conical hill, whose natural defences were a gift of geography to our ancestors when looking for a place to build. It is difficult to speak of the castle and the cathedral without making them all one; they are only separated by a stretch of lawn called Palace Green, and Palace Green is only the size of a village cricket field. They share the protection of the river below and they protect each other by their proximity. Half church of God, half castle ‘gainst the Scot. A clever poem, for the cathedral looks a bit like a castle and the castle is a mixed and massive delight. The castle and cathedral share their plug of rock. As you walk around the town there is a new view of them at every turn, if you crane your neck upwards to see them. Or, once you have climbed to the steep street to Palace Green, you can approach them as the tiny dot that you are, right up to the cathedral’s massive doors, or the castle’s gatehouse, but you never become their equal again, as you did from that first view from the train. Lordly, defended, and a seat of learning. The bones of the venerable Bede lie in the cathedral, and the only other main building on Palace Green is the university library. 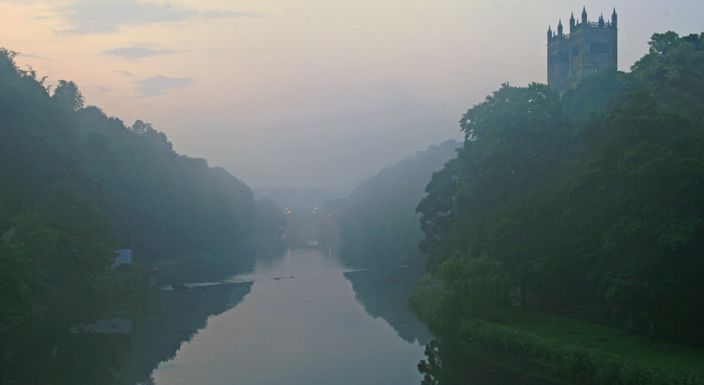 It stretches between castle and cathedral, long and low in comparison, accessible from the front but from the back it is a sheer drop to the river, with rear windows providing views of trees and of the very bridge where the poem is inscribed; the sheer drop removing the library from the everyday, protecting the peace and quiet. My thanks to Anna for allowing me to share this on my blog. Anna has written other pieces that suggest she would make a fabulous travel writer. 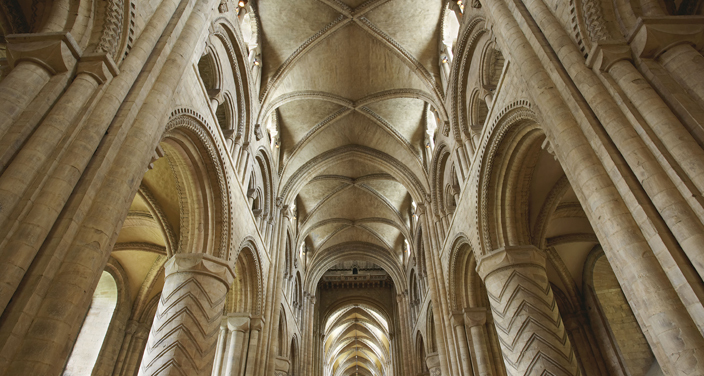 If you would like to learn more about Durham Cathedral, Durham Castle and the Palace Green go to http://www.durhamworldheritagesite.com where you can find a wealth of information on the life and history of this magical place. This entry was posted in Art, History, Writing and tagged creativity, Durham Castle, Durham cathedral, Durham University, history, Sir Walter Scott, travel, writing. Bookmark the permalink. I really enjoyed this post. I live in Durham, so perhaps I don’t look at the castle and cathedral properly often enough. Lovely to see them with fresh eyes.